As 1 Jewish saying goes, 'any good looking apple may have a worm inside". The rest of the article is spot on. Just because the Caspian is a lake, it doesn't mean that the Flotilla is restricted to it. And that a day after one of the news channels in Trumpistan puplished a report about the last "mishaps" of their navy, the collisions with civil ships in the last months. Their findings: poorly maintained ships, their radars couldn´t even see the surrounding civil ships, and poorly trained sailors. One of the helmsman hadn´t touched the navigation system of the ship even once before he was ordered to steer it! When asked by an audience member about how to deal with Russian aggression and military buildup in the Eastern Mediterranean and in the Black Sea, Richardson called for going on the offensive to put Russia on its heels. The admiral said the U.S. needed to consider “not only responses in pushing back [against Russian aggression], but how do we push first in a couple of areas? I think it would be great if we could get folks, Russians, some of these competitors to respond to our first move. There’s an advantage every now and then to playing the white side of the board,” he said. In the US, the CG does harbor patrol & inspections, AFAIK. Missile fired toward Norwegian intel ship Marjata. But no hit. They only scared them. This ship is said to always monitor northern fleet during exercices or deployments. The Russian leader also said that seven new multipurpose submarines would be handed over to the Russian Navy to protect the national interests of Russia two to three years earlier than the deadlines set by the state armaments program, and five surface ships of the far sea zone would be laid down in the near future. Another 16 ships of this class will be introduced into the Navy until 2027. 7 total Yasens presumably? I think 'multipurpose submarines' is how they describe Yasens, I think they normally use different term referencing Kilos & Ladas? 5 new Gorshkovs? Would make for 4 each to North & Pacific fleets. Or some Gorshkovs, some of other class/es eg 20386? Well they knew the ship was there. I doubt they would have used newer missile than this one which seems to be old naval osa. It was probably too close to russian ships so they trolled tgem a little. No report on that just this video. The russian forces always announce well in advance when they use weapons in trials/maneuvers. But we know that the norwegian navy has a lot of troubles even with simple tasks of seamanship. #ВМФ #СФ??????? ?#Russian #Navy Today, February 26, the RFS 454 'Admiral Gorshkov', a Admiral Gorshkov-class frigate / project 22350 departed Severomorsk naval base and start deployed to the Atlantic (possibly the Mediterranean Sea too). Will the Kalibers hit Idlib or Al-Tanf??? Hole wrote: Will the Kalibers hit Idlib or Al-Tanf??? For the Navy, a unique trap target is created. This special underwater drone will simulate the magnetoacoustic "portraits" of submarines of various classes and types. The device will be used during training exercises for crews of anti-submarine ships and aircraft. During the war, the targets will get a real combat mission: they will mislead the enemy forces during the breakthrough of the anti-submarine lines. As reported by "Izvestia" in the General Staff of the Navy, work on the project has already begun, and innovative underwater drones are included in the list of advanced weapons. In parallel, the concept of their combat use is being developed. The new target robot is a drone with a large power reserve, capable of long maneuvering according to a predetermined program. During the exercises, he will replace full-fledged submarines: for this, the drone is equipped with a software and hardware complex that realistically simulates the movement of submarines. The target is equipped with special sensors and sensors, it allows you to lay the algorithm, thanks to which the robot will independently make decisions for maneuvering. The complex technical equipment of the device is capable of reproducing the noise and reflected acoustic fields of submarines of various classes and types. 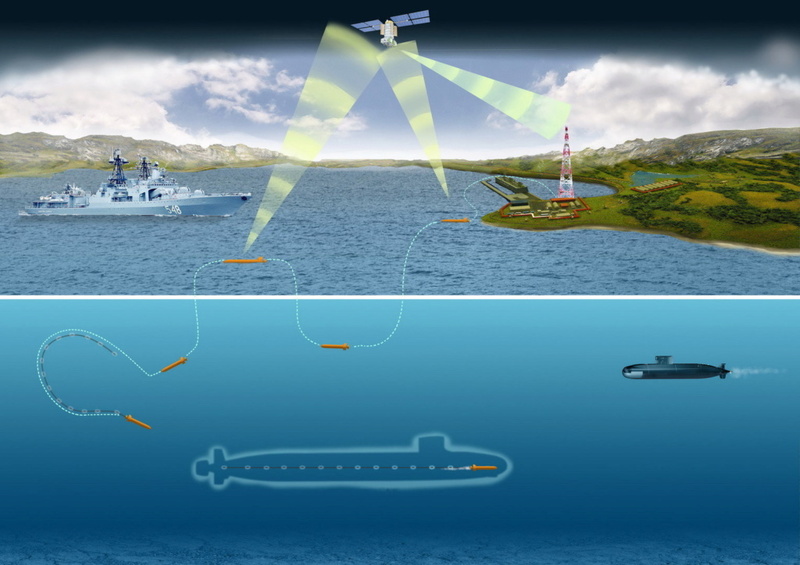 The target imitates reflected acoustic waves, a wake and other markers, unmasking a submarine - it is for them that anti-submarine ships, airplanes and helicopters are looking for enemy submarines. The use of simulators as hydroacoustic targets will be useful when training crews of ships, helicopters and airplanes. First of all, they will be useful for training acoustics-operators of anti-submarine forces. The appearance of a new drone will eliminate the need to remove submarines from combat duty in order to imitate a probable enemy during the submarine exercises, which will help the fleet to save significant funds. It is also important that the target will capture the actions of anti-submarine forces. This information is useful in the analysis of aircraft flights and actions of ships after maneuvers. During the war, trap targets will create dozens of false targets and disorient enemy anti-submarine weapons. The fleet receives more and more sophisticated means for organizing combat training and conducting combat operations, Admiral Valentin Selivanov, the former Chief of the Main Staff of the Navy, believes. “Robotic systems are constantly being improved, which allows us to expand the range of tasks for them,” says Valentin Selivanov. - In peacetime, such a target is a good tool for training your anti-submarine weapons. Special underwater drones will allow you to simulate various situations of a combat situation, including working out many complex elements. For example, a long tracking, during which the boat "lead" by technical means with the readiness of destruction at any time. They will also allow you to check the crews of anti-submarine ships in dueling situations - this method is the most effective way to assess the capabilities of the crews of anti-submarine ships and aircraft. Mil.Press Today publishes the annual rating of Russian Navy's combat capabilities compared to the US one. Although 2018 generally turned out to be a fruitful year with seven combat ships commissioned, its positions regarding US Navy’s capabilities declined. This interview is excellent, many thanks!